Botswana, Chad, DR Congo, Ghana, Guatemala, India, Kenya, Lesotho, Liberia, Malawi, Mali, Namibia, Nigeria, Rwanda, Senegal, Sierra Leone, Tanzania, Togo, and Uganda are using iHRIS to track, manage, and plan for their health workforces. They have moved beyond inefficient paper-based filing systems in favor of robust data and electronic records, which allow users to easily find, share, organize, and manage their information. iHRIS Train, for managing data on the education of health professionals. IntraHealth International, through the USAID-funded Capacity Project, launched the first version of iHRIS in 2007. CapacityPlus continues to develop the core iHRIS software, release updates, and partner with countries to roll out the software and train people to use and maintain it. 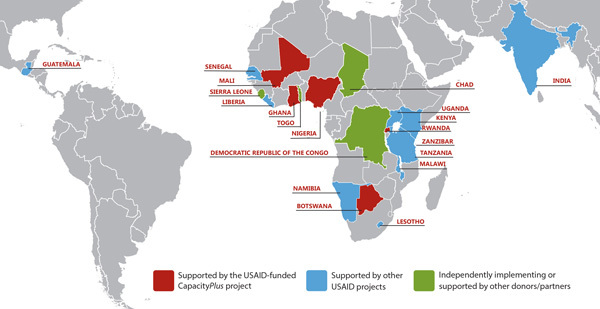 With support in data management and analysis from CapacityPlus and other IntraHealth-led projects, several countries are finding additional savings. The Uganda Ministry of Health used data from its customized iHRIS in 104 of 112 districts to identify vacancies and needed health workers, gained further information from a retention and costing study, and successfully advocated to Parliament for a $20 million recruitment fund, filling 8,000 health worker vacancies and doubling doctors’ salaries. And in Tanzania, the Zanzibar Ministry of Health used data from iHRIS in conjunction with the Workload Indicators of Staffing Need tool to advocate with the president to increase its health workforce by 897 over the last three years—a nearly 3000% increase over the 30 new health workers originally budgeted. Since iHRIS is open source, developers can easily customize the software to meet their needs. In August 2013 the University of Dar es Salaam in Tanzania held the first of what will be an annual iHRIS Academy, bringing together iHRIS users and developers from seven African countries to collaborate to solve data-related challenges. To foster sustainability, CapacityPlus created a global iHRIS community intended to become self-sufficient in supporting iHRIS users. The iHRIS community is effectively growing on its own, reaching 150 members who work across time zones to resolve issues raised on the community e-mail list. Because this open source community provides ongoing updates and support, countries that use iHRIS are collectively saving an additional $32 million every year—that’s how much it would cost them to purchase the same type of updates and support from a for-profit source.